The 2015 standardized test scores for Charleston CUSD 1 elementary schools were below average while the school district spent more than any other elementary school in the region, according to a report recently released by the Illinois State Board of Education (ISBE). After elementary students took the Partnership for Assessment of Readiness for College and Careers (PARCC) exam in 2015, Jefferson Elementary School and Carl Sandburg Elementary School, operated by Charleston CUSD 1, reported a 22 and 24 percent passage rate, respectively, despite spending $10,159 per student. The average passage rate in the region was 26 percent, with the average spent per student being $9,272. Other elementary schools posting below average while exceeding the average spent per student were: Mattoon CUSD 2’s Riddle Elementary School, reporting a 23 percent passage rate and $9,750 in per student spending; Robinson CUSD 2’s Lincoln Elementary School, where only 22 percent of students passed the PARCC exam even though the school spent $9,839 per student; and Casey-Westfield CUSD 4C’s Monroe Elementary School, which posted a 24 percent passage rate despite spending $9,275 per student. Rounding out the schools scoring below average was Parkside Elementary School, operated by Lawrence County CUD 20. The school narrowly missed the average benchmark with 25 students meeting PARCC expectations. Parkside Elementary School was the only school in the region that reported a below-average passage rate and below-average spending per student ($8,963). In contrast, Cumberland CUSD 77’s Cumberland Elementary School and Red Hill CUSD 10’s Bridgeport Grade School tied at 31 percent passage rate – 5 percent above the county average, despite both schools reporting below-average spending ($8,148 and $8,764, respectively). And Marshall CUSD 2C’s North Elementary School also posted an above-average passage rate of 27 percent while spending $7,690 – the least of all the schools in the region and far below the spending average per student. Schools that performed above average in the PARCC exam and that spent above the regional average were: Oblong CUSD 4’s Oblong Elementary School (30 percent; $9,620 per student); and Mattoon CUSD 2’s Arland D. Williams, Jr. Elementary School (27 percent; $9,750 per student). When it came to middle schools in the region, the amount spent per student was directly related to the passage rate of each school – schools that spent above average per student reported above-average passage rates. The average middle school passage rate was 26 percent, while the average spent per student was $9,092. Charleston Middle School operated by Charleston CUSD posted the highest passage rate of 39 percent and spent $10,159 per student -- more than any other middle school in the county. Robinson CUSD 2’s Nutall Middle School reported the second highest passage rate of 34 percent and spent $9,839 per student. Reporting below-average passage rates were: Marshall CUSD 2C’s Marshall Junior High School (23 percent; $7,690 per student); Lawrence County CUD 20’s Parkview Jr. High School (13 percent; $8,963) and Cumberland Middle School, operated by Cumberland CUSD 77 (19 percent; $8,148 per student). A similar pattern observed in middle school scores was seen in high schools in the region. Schools that received above-average funding per student reported above-average passage rates. The average high school passage rate was 26 percent, while the average amount spent per student was $9,134. The highest passage rate was reported by Charleston High School in Charleston CUSD 1, where 37 percent of the students passed the PARCC exam. The school spent $10,159 per student – the highest in the county. Mattoon CUSD 2’s Mattoon High School also reported a passage rate of 37 and spent $9,750 on each student. Following closely behind was Robinson High School operated under Robinson CUSD 2, reporting a 36 percent passage rate and $9,839 in spending per student. Oblong CUSD 4’s Oblong High School rounded out the above-average test scores in the region by posting a 31 percent passage rate and spending $9,620 per student. Schools that reported below-average scores and below-average spending were: Marshall CUSD 2C’s Marshall High School (25 percent; $7,690 per student); Red Hill CUSD 10’s Red Hill Jr/Sr High School (23 percent; $8,764); Casey-Westfield CUSD 4C’s Casey/Westfield JR/SR high School (18 percent; $9,275); Lawrence County CUD 20’s Lawrenceville High School (13 percent; $8,963 per student) and Cumberland CUSD 77’s Cumberland High School (10 percent; $8,148). 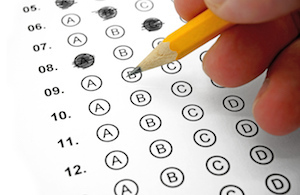 The PARCC test is a standardized exam used in several states to evaluate schools and student performance. Illinois began using PARCC tests to assess its students in 2015.